In this article, we will explore the new features that SharePoint 2019 brings in and the features it has left behind. Microsoft states SharePoint 2019 brings the cloud closer to the customers and the customers closer to the cloud. This statement is self-explanatory, and means that most of the features that were only available with the cloud (SharePoint Online), so far, are now also made available to on-premise users by SharePoint 2019. Microsoft mentioned that SharePoint 2019 is built on the same core platform for SharePoint Online, as was done for SharePoint 2016. Because of this, it brings in modern experiences to the end users. SharePoint 2019 features are mainly focused around the below areas. SharePoint 2019 supports features that users felt were lacking in SharePoint 2016 including the hybrid environments. 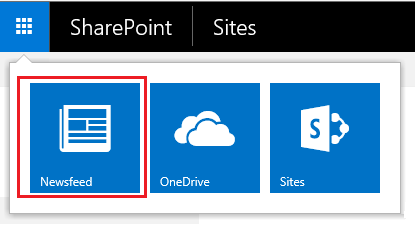 SharePoint 2019 brings in improved OneDrive Sync Client which supports personal and team sites. It also includes push notifications. It helps to sync and share solutions like Box or Dropbox. SharePoint 2019 central administration includes direct links to documentation, updates, etc. This will reduce the searching efforts for related documentation and look out for patching information. A hybrid status bar is added to the top area of central administration site. 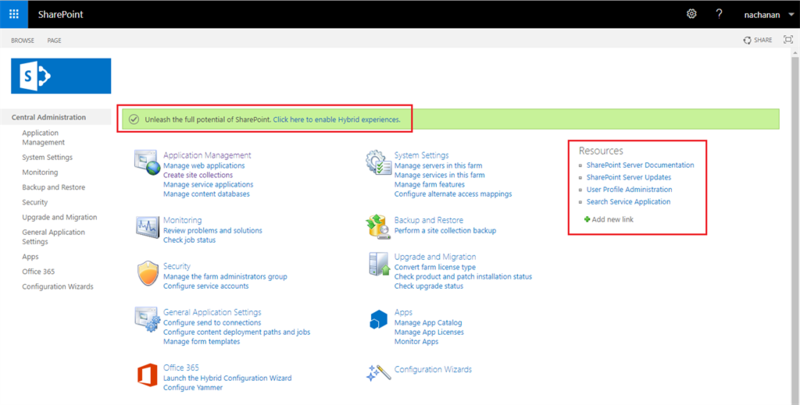 If the SharePoint 2019 environment meets the minimum system requirements to enable hybrid, the hybrid status bar is turned green and helps to launch the SharePoint Hybrid Configuration Wizard. We will be now able to take advantage of using any authenticated SMTP (including Office 365) to send emails. The cloud features PowerApps and Flow are now available in SharePoint 2019. These features need to be configured via gateway but make their existence in on-premise. These features will help to automate the business processes. As there are plenty of new features brought in by SharePoint 2019, it is also time to say goodbye to some old features. SharePoint Newsfeed feature was helpful to start a conversation with users. The "Start a conversation" box to type the message will no longer be available. Also, its tile in the app launcher is not available. Hub sites help to share things like navigation, logo, and themes across connected sites. Also, it rolls up news and activities from connected sites at one place. Unfortunately, this feature does not have a place in the on-premise release and is available only in SharePoint Online. The on-premise help engine synchronizes the data with Office 365. Once again, there will not be a new rollout of SharePoint Designer for SharePoint 2019. However, Microsoft has ensured that SharePoint Designer 2013 will work with SharePoint 2019 for the remainder of client support lifecycle (2026). Visio services uses PNG based or Microsoft Silverlight based rendering. Silverlight support is ending by October 2021. Because of this reason, Silverlight based rendering option is not supported in SharePoint 2019. Multi-tenancy is being promoted in SharePoint Online and has dependency on many of the cloud technologies that will be expensive to bring in for on-premise. Due to cost and complexity issues, multi-tenancy is not available in SharePoint 2019. Sandbox solutions are packages targeted to a specific site collection in SharePoint. They were deprecated earlier and then removed from SharePoint Online. It is also removed from SharePoint On-Premise versions. Microsoft has recommended SharePoint add-in model as an alternative. SharePoint 2019 does not deviate much more from SharePoint 2016. However, it brings in cloud features to on-premise to some extent. SharePoint 2019 brings in modern experiences, responsiveness and enhanced hybrid, scaling, security and compliance capabilities.